A lot of you have asked how Paul and I are managing with the language here in Hong Kong. Let me say first that 99.9% of the people I have been encountered in Hong Kong speak better English than I speak Chinese. Hong Kong is officially a bilingual city with English and Chinese having equal status under The Basic Law (HK’s constitution). As a result of British colonization, a lot of street and place names are English, especially on Hong Kong Island, and English is widely taught institutionally from age one upward. It is certainly easy enough to get around Hong Kong with only English in your linguistic toolbox. Street signs are in both languages. Public transportation signage and announcements are always in both languages. Taxi drivers on the other hand rarely speak English. I have learned how to say the name of our apartment complex in Chinese and am always quite chuffed when I use it and it works. It helps to have your destination pinpointed on your mobile’s maps or to have the amazing Hong Kong Taxi app. Paul’s meetings are 95% in English. The only time he has needed a translator for business is when he has been in mainland China or sometimes for public consultations in HK. Virtually all professions operate equally in English and Chinese. Shopping offers up a mixed bag. I know not to expect any English from the small shopkeepers or markets. Sometimes I take along a picture if I am looking for something specific in the markets. In medium-sized stores like drug stores, there are about six clerks at the door saying “Hello, welcome” but I rarely get any service beyond that. I suspect it is because that is the extent of their English. In mall stores you will get fair to excellent English. Let me repeat, most people’s English here is much better than my Chinese. 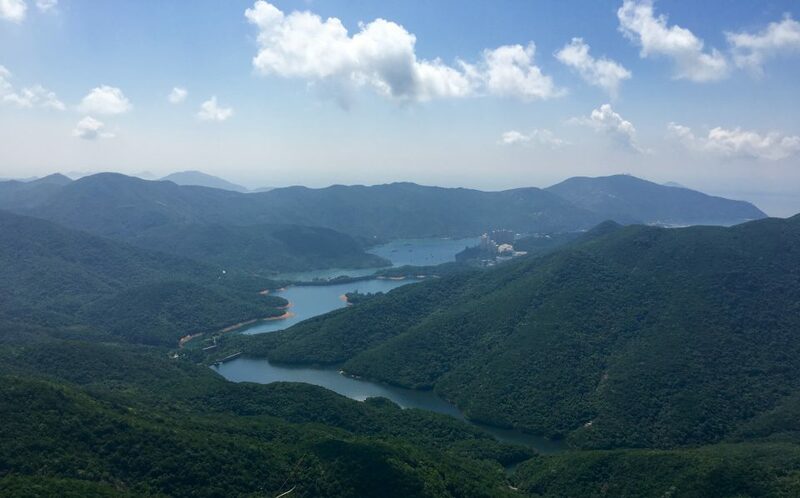 There are many, many areas where everything is only in Chinese, especially on the Kowloon side and into the New Territories where I think it would be very hard to live if you didn’t speak the language. Even on the Island, neighbourhoods abound where signage for shops and goods is unilingual Chinese. This is especially perplexing when you don’t recognize what those goods are, like in all the dried seafood shops on Des Vouex Road or the markets. 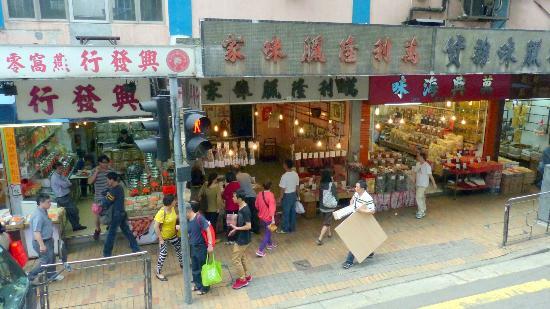 Des Voeux Road is filled with dried seafood shops and other exotic fare like dried locusts and snake skins, as well as Chinese tonics and herbal remedies. I love this shop in Wan Chai with its spices and sauces and other goodies tucked away on the shelves. Its treasures are accessible to me because the owner’s English is good. A lot of the time, you really need to know what you are looking for. This is one of the oldest noodle-making shops in HK, but I would never have known it from the outside! I have met ex-pats who have been here for 26 years and don’t speak a word of Chinese. I can see how that would be entirely possible. Paul and I are managing alright, although there is no question that in a great many situations, context is completely missing. I don’t mean to categorically say that this is a bad thing, but the fact is, Hong Kong is becoming more and more Chinese. I can sense it, expats who have been here a while can see it, and locals tell me it’s happening. A case in point is the increasing lack of translation by the government, in spite of HK being officially bilingual. Many major policy announcements are made in Chinese only. The Chief Executive (the head guy here) has been criticized recently for having made, in the last year, 61 speeches in Chinese, 28 in English, and six delivered in both languages or offering translation. This compares to the previous head guy who delivered 49 speeches in both languages or with English translations, and nine in Chinese only. Coming from Ottawa, Canada where bilingualism was enforced – or else!! – it’s not hard to see the rather loose translation of official bilingualism that exists here. It trickles down from there. I confess that I have a terrible time understanding many young Chinese people speaking English, and I’m talking about some who are in the news a lot. While I can get the words, their sentence structure and line of thought can be totally confusing. I am now beyond being embarrassed asking young people to repeat what they have said; it happens all the time in banks or on the phone. I don’t know what kind of English they are learning in school and university, but I can tell you it is not good. I remember reading in the South China Morning Post the “manifesto” of the Occupy protestors. There were so many grammatical and structural errors; it was run-on and repetitive and didn’t a make a point, and I would have graded it a “C” at best. No editing services needed here! This is a sign in a small private shop in Central. While this is amusing to Anglophones, it is a sad statement about where English is going here. Hong Kong touts itself as being “Asia’s world city” but pundits are increasingly calling it “just another Chinese city”. Having said all this, just about everyone here speaks way better English than I speak Chinese. There. I am deservedly self-chastised. Love the blog on languages; and the pictures say a thousand words in any language! Anyone who has travelled to a foreign country knows how difficult it can be to do the simple things like make a phone call or purchase something, anything — and get your message across. It’s a feat of charades and fractured language. So much fun!